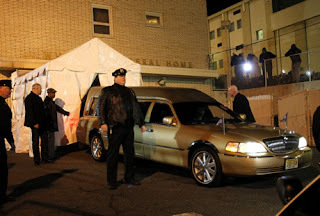 It has been reported that the Bodyguard actress Whitney Houston’s funeral arrangements are being done at Newark’s Whigham Funeral Home, though the 48-year old singer lived most of her life on the west coast, her funeral may take place close to her roots. Sources reported on Monday that the preparations are being done at Whigham Funeral Home, but it is yet to be confirmed. The funeral home in Houston’s hometown also handled the services for her father, John Houston, who passed away in 2003. It is also being told that Houston’s family has scheduled for holding a wake Thursday and funeral Friday at Newark’s Prudential Center, an arena that that has got a seating capacity for about 18,000 people. It was also reported that as if Monday the body of the most-awarded female of all time was en route from Beverly Hills to Newark, NJ. There still no reports about the cause of death, I Look to You singer’s body was found by a bodyguard partially submerged in a bathtub inside her Beverly Hilton hotel room on Saturday afternoon and paramedics pronounced her dead at 3:55 p.m.
Officials have completed an autopsy and toxicology results are pending, and her cause of death remains unknown.